Yesterday was the best day ever!! I'm so, so sad that I didn't get any pictures, I would have loved to share it with you all! Next year! But I bought an old sign that says "antiques" that I'm very excited about, and a little white bird for a bird mobile I'm working on. 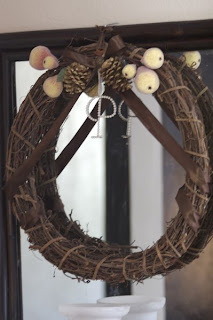 I made this wreath to hang on my mirror in the corner of the living room. It reminds me of something I saw in a Pottery Barn catalog once. 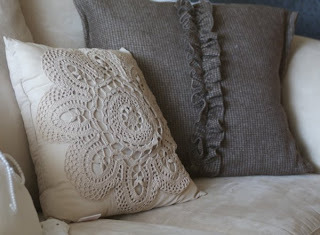 This is the pillow (the brown one) that I made after the mushroom pillow of death. I really like it, it looks like tweed, but it feels like flannel. 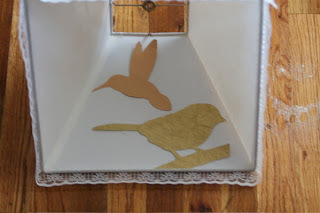 And I was experimenting with bird cut-outs on this lampshade (it's a really fun thing to do)! 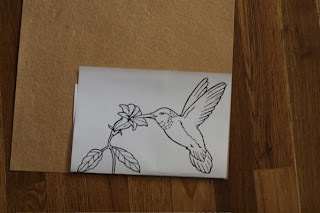 And paste them to the back of your lampshade! But I ended up making a flower for it instead, using the tutorial at My Mama Made It. I love it. 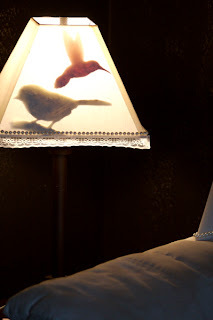 I still might use cut-outs on a lampshade in another room. You can't really see the cut-outs when the lamp is off, so I thought it would be cute to surprise my husband with an "I love you" cut-out when he turns on the lamp on our night stand! Well I'm off to rest and relax with my family! 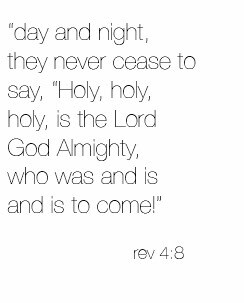 Happy Sunday to you all! Glad to "see" you back! The antique show sounded like so much fun! Oh that's an adorable idea! Thank you! You could do that with lots of other things, too. Fun! I love all of the things that you made for your living room. Everything looks like you could have bout it in a store. 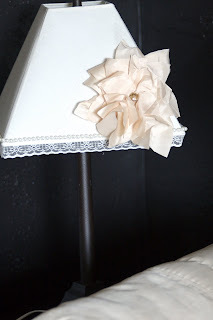 I love that lampshade cutout idea! Those pillows look so rich! Wow. I want you to know that you amaze me!! I love coming to this blog to get great ideas. I just sewed a pillow today after seeing the cute pillow on here with the ruffle going down the center. I used some left over brown raw silk and it turned out beautiful! Thanks for all the inspiration!! !